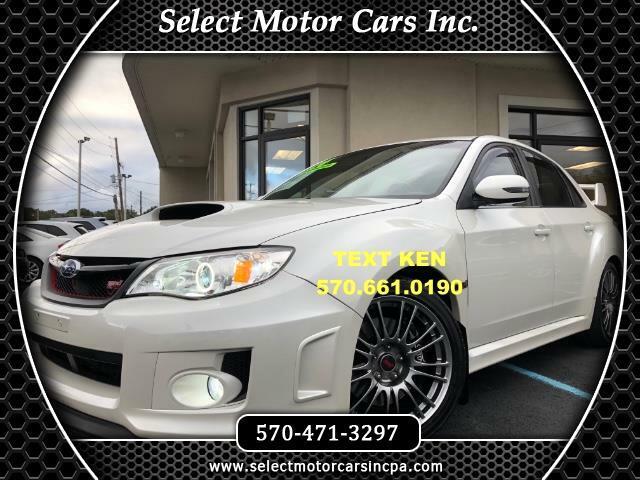 Used 2014 Subaru Impreza WRX STI Limited 4-Door for Sale in Moosic PA 18507 Select Motor Cars Inc.
1 OWNER STI LIMITED AWD ADULT OWNED COMPLETELY STOCK HEATED LEATHER SUNROOF NAVIGATION ONLY 9K! 1 Owner 2014 Subaru WRX STI Limited AWD in gorgeous Crystal White Pearl exterior with Black interior & Red stitching. Features include 2.5L 4 cylinder turbocharged engine,6 speed manual transmission,Limited trim package,all wheel drive,LED fog lamps,LED Halo upgraded lights,LED headlamps,front air dam,dual power heated mirrors,18" premium wheels,rear spoiler,keyless entry,dual exhaust,privacy tint,weather tech rain guards,power sunroof,premium leather interior,heated front seats,steering wheel controls, cruise control,traction control,on board computer,rear defrost,premium sound system,cd player,HD radio,sirius XM radio,Navigation system,bluetooth connectivity,auxiliary input,12v outlet,intelligent SI Drive system,center console,cupholders,amongst many other great features. Buy with confidence this one comes fully serviced and detailed along with vehicle history report. We do accept trades and offer financing to those who meet our lenders criteria at low interest rates Visit Select Motor Cars Inc. at 4805 Birney Ave Moosic PA 18507 to see more of this vehicle or any other in inventory. As always we pay top dollar for clean trades whether you buy ours or not so stop in today! Call us at 570-471-3297 today to schedule your test drive or to chat about any vehicle of interest. Proudly serving local northeast Pennsylvania communities and Nationally around the world since 2004! While every effort has been made to ensure display of accurate data, the vehicle listings within this web site may not reflect all accurate vehicle items. All Inventory listed is subject to prior sale. The vehicle photo displayed may be an example only. Pricing throughout the web site does not include any options that may have been installed at the dealership. Please see the dealer for details. Vehicles may be in transit or currently in production. Some vehicles shown with optional equipment. See the actual vehicle for complete accuracy of features, options & pricing. Because of the numerous possible combinations of vehicle models, styles, colors and options, the vehicle pictures on this site may not match your vehicle exactly; however, it will match as closely as possible. Some vehicle images shown are stock photos and may not reflect your exact choice of vehicle, color, trim and specification. Not responsible for pricing or typographical errors. All advertised prices exclude government fees and taxes, any finance charges, any dealer document preparation charge, and any emission testing charge. The price for listed vehicles as equipped does not include charges such as: License, Title, Registration Fees, State or Local Taxes, Dealer Prep, Smog Fees, Credit Investigation, Optional Credit Insurance, Physical Damage of Liability Insurance, or Delivery Fees. DEALER makes no representations, expressed or implied, to any actual or prospective purchaser or owner of this vehicle as to the existence, ownership, accuracy, description or condition of the listed vehicle's equipment, accessories, price, specials or any warranties. Any and all differences must be addressed prior to the sale of this vehicle. Message: Thought you might be interested in this 2014 Subaru Impreza WRX.